Those who claim, “You can’t teach an old dog new tricks,” obviously haven’t put their hands on the new KICKR. Our newest iteration of the cycling world’s most beloved smart trainer has arrived with more ammo than ever in its arsenal. What’s new with the KICKR? Well, we’ve heartily improved the disc brake clearance, expanded 12×142 Thru Axle Compatibility, and added 12×148 Thru Axle Compatibility. That means more rides can fit this badass training machine (go ahead – toss your adapters). Fear not though; we’ve still maintained our industry leading ride feel and durability, with no lapse in power (2000+ Watts) or accuracy (+/-2%). The upgraded KICKR also brings support for our newest battle machine: the KICKR CLIMB. It’s our real-time grading mechanism that replaces the front wheel on your smart trainer. Say hello to the most immersive indoor experience you’ve ever had. But for those who think they’re just too old school for our new KICKR and CLIMB, we challenge you to see what can be accomplished when you put the KICKR and KICKR CLIMB to the test. Here are some goals you can reach with the KICKR. With our upgraded KICKR system, we’re pumping out the most accurate measurements of your training. In conjunction with the Wahoo Fitness ELEMNT, our ecosystem will keep you informed during your training. Working on your cadence or threshold? We’re calculating professional-grade metrics. We challenge you to put that advanced data to good use this year. And don’t worry: it’s okay to obsess over your metrics. We obsess with the numbers too. This is a safe place. New Thru Axle compatibility means all of your bikes can be used on the KICKR. We heard your needs and engineered a more capable ride. 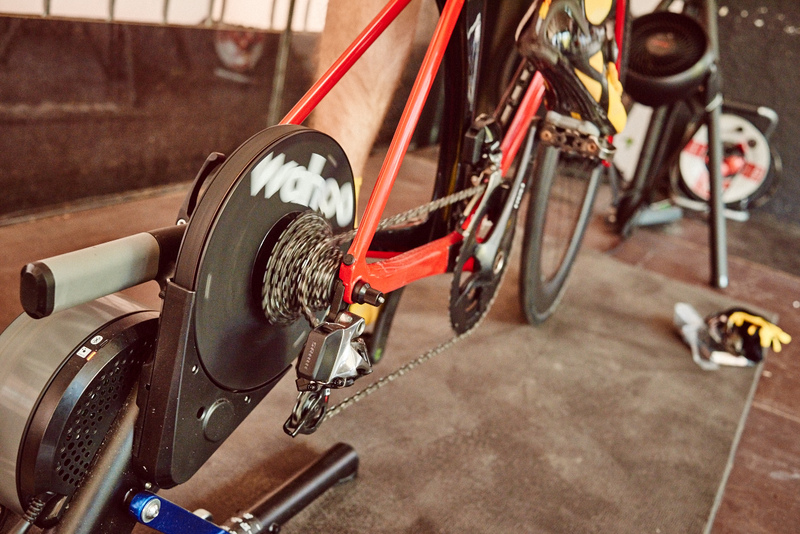 Set up your indoor training space with the bike you want and save time. Busy schedule? No excuses not to ride with the new KICKR. Try your brand new bike out on the KICKR! The creation of the KICKR CLIMB will change the way you train. We designed the CLIMB to work exclusively with the KICKR and KICKR SNAP. Now, you can experience real-time gradient changes on virtual routes and structured workouts from your favorite training apps like Zwift or TrainerRoad. You’ll love the feeling of the CLIMB – it replicates the climbing grades you love to hate. Whether it’s climbing to the top of Zwift’s South Pacific virtual paradise Watopia, or conquering the real Alpe d’Huez’ 7.9% average gradient downloaded to your ELEMNT, expect to feel some burn within your favorite training program. Or, if you’re feeling adventurous, chart your own course — the KICKR CLIMB can handle it. Fly through a -10% descent or rise to an insane +20% gradient; the choice is yours with a tap of the remote. Your bravery is only the limit. Did you follow your friend on Live Track while they attempted Super Flag, and now you want to try? The KICKR was crafted to help you better prepare for the ascent. With the introduction of the CLIMB to the Wahoo Fitness ecosystem, you can train for your next cycling trip by downloading your favorite Strava segments and experience the hills in real, elevated immersion. With our two new products, the KICKR and KICKR CLIMB, you’ll be experiencing stronger workouts, more realistic hills, and have more compatibility to ride your way. Learn more about the KICKR CLIMB, and check out how to fit it into your training style!